You have a red and blue star, both could be planets or both could be stars, they could be very close to each other or far away. They could be 16 billion light years away from us or just a few light years or less. nick c wrote: Stars in close proximity on a star map could just be lined up. You need more evidence than that. Why does Astronomy not know that Gliese 832 is a double star? They are pretty good at detecting things like that, what technique do you know that they don't? See the section on "Optical Doubles"
The sci-news article does not speak of optical double either! Once you mention a double, even if it is just optical, several reasonable questions arises. What kind of heavenly body is the double? Is it a star or a planet or something else? What is its designation ( database references /SIMBAD/ exoplanet archive/ extrasolar planets ) ? What is its distance from the Sun? Is it closer or further from GJ832? Why do we see different color temperature in the overlapped area instead of eclipsing of the further object? The main stream media/"science"/propaganda systematically ignores what cant be explained with the status quo. Last edited by pavlink on Tue Jul 01, 2014 1:52 pm, edited 1 time in total. Please, give us the coordinates ( RA:Dec ) so anybody can check it themselves. Gliese 832 is red dwarf star orbited by two known planets - Gliese 832 b, a Jupiter sized planet; and Gliese 832 c, the "super Earth" of the thread title. That is what is known. There is no known stellar companion unless you consider b to be a brown dwarf. If they can detect a terrestrial planet such as c then a brown dwarf would be easy enough to detect. Where could the alleged stellar companion hide? There is a red dwarf orbited by a gas giant and a terrestrial planet. Maybe there are some other planets, but no companion star. It is just not there. nick c wrote: Gliese 832 is red dwarf star orbited by two known planets - Gliese 832 b, a Jupiter sized planet; and Gliese 832 c, the "super Earth" of the thread title. That is what is known. There is no known stellar companion unless you consider b to be a brown dwarf. 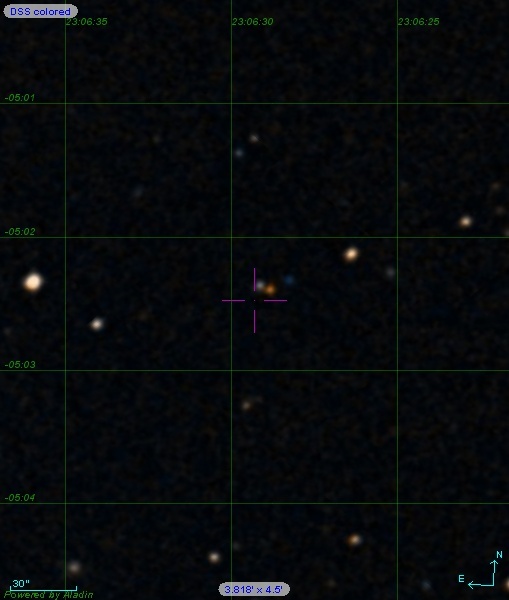 The second object, seen in blue, in the picture could not be Gliese 832 b.
Gliese 832, the red dwarf star seen in red in the picture, has mass of 0.45 and radius of 0.48 compared to the Sun's. Gliese 832 b, the Jupiter sized planet, has a mass of 0.64 compared to Jupiter's. Note that there is not accepted radius for Gliese 832 b, thats due to the discovery method Doppler spectroscopy not direct observation. Jupiter's diameter is one order of magnitude smaller (×0.10045) than the Sun. Suppose that Gliese 832 b has the similar ( not at different magnitude ) density as Jupiter. Than radius of Gliese 832 b should be many times ( x 7 ) smaller than the star's Gliese 832 radius. That contradicts to the visually close to equal radii ( and diameters ) of the two objects on the picture. nick c wrote: If they can detect a terrestrial planet such as c then a brown dwarf would be easy enough to detect. Where could the alleged stellar companion hide? It is hiding in plain site. It is difficult to see something when your paycheck, your career and credibility depends on not seeing it. pavlink wrote: It is difficult to see something when your paycheck, your career and credibility depends on not seeing it. While that statement may be true, it does not apply to this situation. Astronomers have no reason to suppress information that Gliese 832 is double star! There are many double star systems, there is nothing to suppress, a stellar system is either part of a double or multiple system or it is not. Either way it is not paradigm shaking news. Why would astronomers conspire to suppress knowledge of a "hidden" companion to Gliese 832, what is to be gained? Why do they not suppress the fact that Alpha Centauri (at a distance of 4 light years) is a double star? triple if Proxima is part of the system. Sirius at 8 light years distance, is also a double star, nobody is suppressing that! The data leads us to the conclusion that Gliese 832 at 16 light years is a lone red dwarf star with at least two planets. There is nothing to suppress and there is no indication that there is a companion star. B. they are far enough part to see their positions relative to each other changing constantly (as they orbit each other). ...for currently accepted planetary formation theory to be correct. But don't worry a bandaid is being fashioned to remedy the undesirable results. This exoplanet passed in front of its parent star, a binary pair, every 138 days, eclipsing their light. Kepler 64-b´s binary parents in turn are orbited by another binary pair of stars! According to all only-gravitation models of the universe the planet should or could not exist at all. Did the standard cosmologists already invent something new to explain the forbidden planet? And are there first ideas of plasma cosmologists or Electric Universe proponents of explain this system? Any ideas? Thank you very much for pointing me to these TPOD´s, Kiwi! Bomb20 wrote: Did the standard cosmologists already invent something new to explain the forbidden planet? Forbidden Planet? Maybe one of the "stars" is the blaze of the Krell machine blowing up? TRAPPIST 1 is ( at least ) a double star system. Look at the red and blue stars in proximity. Red and blue ( false colors ) represents different NIR bands. Considering the white star in proximity it could be a triple star system. The brown dwarf star is detected by the orbiting infrared telescopes.